A large portion of Star Wars fans had a lot of trouble accepting the Ewok characters. Many were put off by their "cutesy" nature and thought they were merely a marketing ploy. Others scoffed at the believability of these small forest bears taking on the mighty Imperial army and winning. It's interesting to note that in earlier drafts of Jedi, the Ewoks were actually replaced with Wookies. Now imagine hundreds of Wookies like Chewbacca fighting it out with Stormtroopers, there's a believable battle. 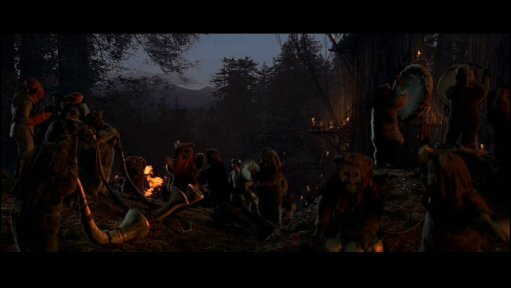 Nonetheless, the taint of the Ewoks spilled over to the Ewok song at the end of the movie. For some, it was tough to hear the last song of entire series to be sung by some scruffy bears. The end of Jedi signalled the final battle in a long fought war by the Rebels to overthrow the evil Empire. It should have been accompanied by a more regal or epic piece of music. Instead, the Ewok song could be interpreted as being a bit juvenille. Now having said that, they are some merits to the Ewok song. For one, the song has infiltrated popular culture. Mention "the Ewok song", and I think most people would understand what you're talking about (ok, mainly us geeks, but it's close). Even late night talk show host Craig Kilborn is a big fan of the Ewok song. If you click here (kilborn-ewok.mp3 - 622 kb), you can hear Craig sing his own wonderful rendition of the Ewok song. It's really quite entertaining. I credit Kilborn for bringing the term "yub nub" to his vast audience. It's clear that the Ewok song is appealing for reasons other than what Lucas probably intended. It's a bit goofy and it's most likely a very fun song to sing while drunk. Just for completeness, click here for the lyrics to the song.